Sale Barns Directory - Page 5 - O Horse! We primarily focus on training young horses from private owners and also from our own breeding and then selling them or attesting for sports. The horses are trained by experienced riders. 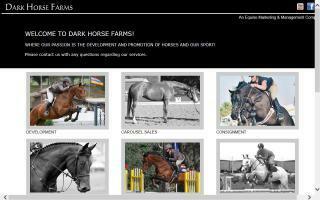 Dark Horse Farms is a premier hunter/jumper show stables and equine management company. Our customized program focuses on the development and sales of show jumpers and derby hunters from young prospects to proven veterans. 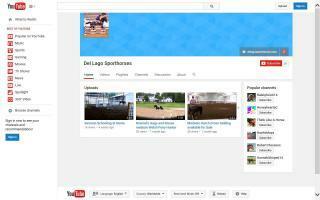 Dark Horse Farms offers top quality management, training, and marketing for competitive show horses. Our show schedule consists of traveling to USEF, PCHA, and FEI rated competitions an average of 1-2 times a month with the purpose competing and developing top show jumpers and hunters. Our time on the road and in the show ring provides multiple opportunities for us to promote our horses, clients, sponsors and the sport of show jumping. 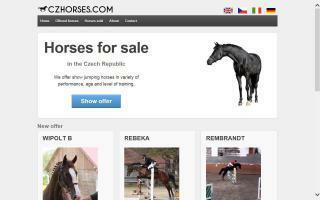 Have a horse for sale? Send it to us! Dark Horse Farms specializes in the sales of quality show hunters, jumpers, and equitation horses with good conformation and temperament. Our consignment program is specifically designed to effectively market and promote your equine investment and is tailored to your horses specific need. We understand the importance of finding the best suited home for your horse while properly managing their daily care and conditioning. We are a private horse boarding, quarter horse sales, and training facility. We strive at all times to offer a comfortable environment where horses and their people can enjoy a fulfilling relationship away from the stress and hassle of everyday life! All horses, no matter their breed, pedigree, conformation, or disposition, are champions in the eyes of the people that love them and are treated as such by everyone at Daughter of D4! We care for your horses according to their individual needs and personalities. Since we have 3 horse barns, 7 grass pastures, 2 large dry lots, and 1 small dry lot, we are able to accommodate a variety of horses, including stallions, geldings, mares, mares with babies, and retired and older horses, as well as those with physical limitations. On 20 beautiful acres, we offer 11x12 stalls with outside windows, daily rotating turnouts (individual and group) on grass and dry lots, a large indoor lighted arena, a large outdoor arena, a heated indoor shower for horses, and a heated indoor bathroom with a shower for people! Visit our web site to get an overview of the services we offer, and then contact us regarding any questions you may have! We are primarily a sales barn specializing in the importation of sporthorses for use as jumpers or hunters, or for dressage, equitation, or eventing. We have horses available for sale in various price ranges, experience levels, and capabilities. We attend shows from local to "A" rated. We accept horses in training of all ages, breeds, and disciplines. We provide private lessons on your horse or one of ours. We will travel to your facility. We are located in a serene setting on a private cove on Lake Conroe just across the road from the Sam Houston National Forest. - Around the clock supervision of horses. Lunging is utilized in the training of riders and horses. All of our hunter and jumper horses and riders are taught the fundamentals of dressage. Lesson program, professional sales, and show barn. Derby Hill is a premier hunter/jumper show stable run by top professionals Vanessa and Buddy Brown, the latter and former Olympian. A full service facility, Derby Hill offers lessons, training, showing, sales, and syndication programs to fill every client's needs, from first time on horseback to Grand Prix competitors. Located on 120 horse friendly acres with box stalls, turn outs, an 80 by 200 indoor arena, a 200 by 320 outdoor arena, and trails through the property. Detersmination Equestrian Center is a state of the art facility conveniently located off the 96 expressway (Nunica exit) just minutes from Muskegon, Grand Rapids, or Grand Haven. It is situated on 25 acres and offers one of the largest indoor arenas in west Michigan, measuring 80' x 260'. It can be set up for a full size dressage arena and has outstanding footing suitable for all disciplines. Available for your use are numerous trail obstacles, jumps, cavalettis, dressage cones & mirrors. Observe from the heated kitchen/observation area or the upper deck seating area. A full heated bath is available for our boarders, as is the climate controlled tack room. We offer twenty-six 12 x 12 matted stalls with built in thermal water buckets. We feed custom blended grain or Strategy 2X per day, and horses have access to free choice grass hay (round bales in winter) or multiple hay snacks throughout the day. Extended turnout in large grass pastures is provided (weather permitting), or they get inside exercise. In addition to the inside facilities, we have a 110' x 360' outdoor grass arena, groomed trails, plenty of country roads, a fire pit, and a hitching post. Barn vet checks and farrier visits are scheduled for your convenience. Horses are consistently cared for by the facility owners, who have decades of horse and medical background. We are former boarders who take care of your horse as if it were our own. Our outstanding trainers have the credentials of National and World 10 tens and Championships in multiple events, who train in all disciplines. We offer lessons on your horse or ours, onsite shows, a traveling show team, and clinics, or you can sponsor a 4H group. Just have fun while taking our horsemanship seriously. Please join us for the week, month, winter, or year-around. For more information, call or check us out on the web. Are you needing your equine/livestock transported? You can trust your precious cargo in the hands of our 30 years of horse/livestock handling transporting horsemen. We are a small family owned and operated business, and we take great pride in the safety of all of our cargo and customer satisfaction. We have been in the training business for all of our lives and have experience with all kinds of horses and livestock. We are 100% FULLY INSURED and meet ALL requirements to transport all across the country. We do offer multiple horse discounts and will be glad to customize a trip that best suits you and your equine. We provide quality coastal hay and water for the trip. You are more than welcome to send the hay that your horse is accustomed to if you would like. We make trips up and down the east coast and out west. We also have several reputable stables that we use for overnight stays if you wish, at an additional charge per night. We strive to deliver in a very timely manner and have our cell phones on at all times for you to call anytime to check on your horse and for us to call you with updates during our trip. For further information, check out our website or call us for a quote. We do per mile cost as well as flat rate shipping depending on distance to be hauled, number of horses to be hauled, and when transportation is needed. We will be happy to transport rescue horses if they are going on our same route and we have the space available on our trailer as long as there are no medical issues that will interfere with our schedule or other horses. All necessary paperwork is required. Check out our website or call Abby Barefoot at (910)379-1487 to request a quote! WE MAY NOT BE THE CHEAPEST, BUT THE BEST USUALLY AREN'T! 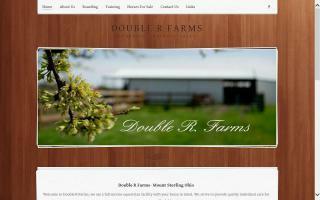 You will be happy you choose Double B Livestock for all of your transportation needs! Private farm offering full care stall board & pasture boarding. Limited spaces available. Located 9 miles from Deer Creek State Park. Training also available.